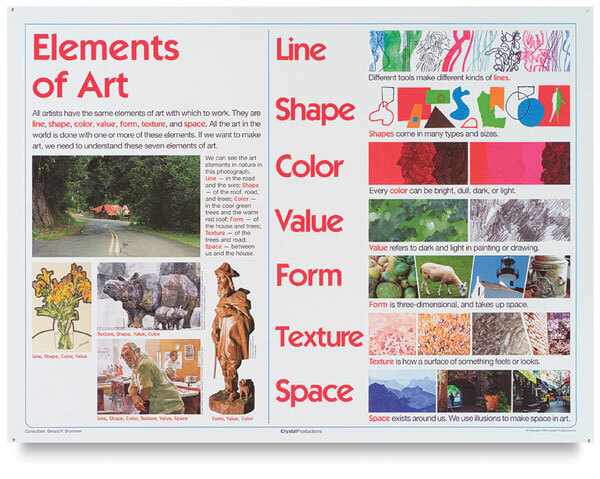 The elementary version of the original elements and principles of design posters helps students in grades 3–8 develop their art knowledge and skills. A teacher’s guide is included with suggested activities and a glossary. The 18" × 24" posters are printed on heavy card stock with a protective UV coating. There are eight posters per set. 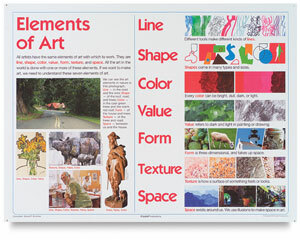 Elements Set — The Elements poster set covers Line, Form, Shape, Texture, Color, Space, Value, and Overview. Principles Set — The Principles poster set covers Balance, Pattern, Contrast, Rhythm, Emphasis, Unity, Movement, and Overview.